The contest is receptive internationally for all amateur and professional caricaturists. 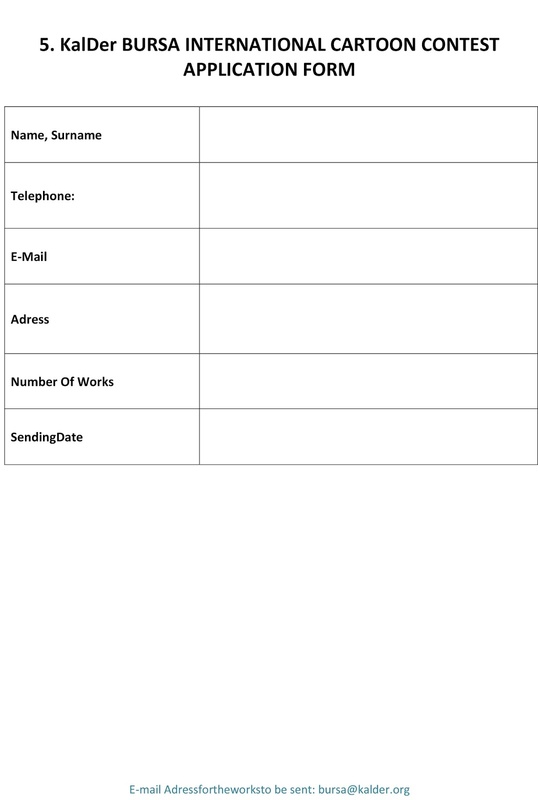 Application: Limited with three (3) caricatures, may be e-mailed to bursa@kalder.org in 300 dpi jpg format.. Deadline: January 17, 2018, Wednesday..
5. 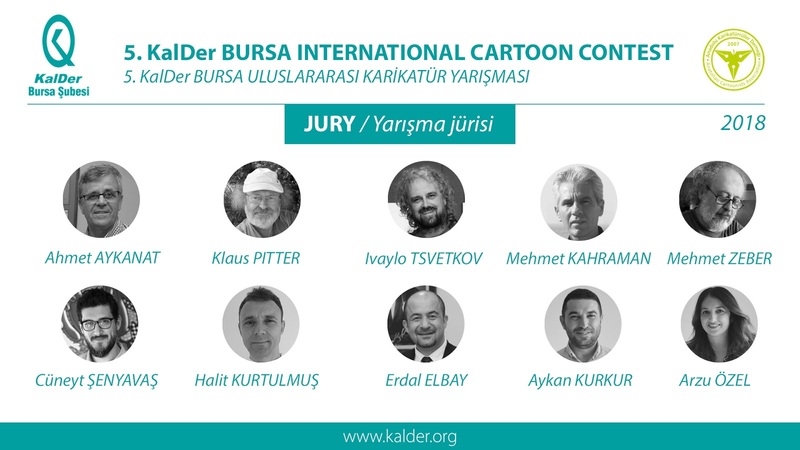 KalDer Bursa International Cartoon Contest Bursa, Turkey.. Explanation about the topic of the contest: The Ephesians Philosopher Herakleitos explains the problem of being in the metaphysical understanding of ancient times with the word 'Panta rei'. According to him, the universe is a constantly flowing process, a change that has no beginning and end. In this process there is nothing that does not change and goes on. Cities are being reshaped according to needs. The sources that are at risk of extinction, necessitate harmonious production with nature. Innovative ideas stand out in the face of changing customer expectations. Countries are examining their economic, social, cultural and technological structures. New strategies are identified in national development policies and plans. Today's changes and transformations seem to make it possible for us to grant Herakleitos, the ancient metaphysical thinker. Today's young and equipped managers take their place in the business world and see the inevitability of using the time effectively to keep pace with the era. Today's young and equipped managers take their place in the business world and see the inevitability of using the time effectively and keeping up with the times quickly. The industry and the service sectors know the necessity as much as in whole life, to keep pace with this transformation. 4. 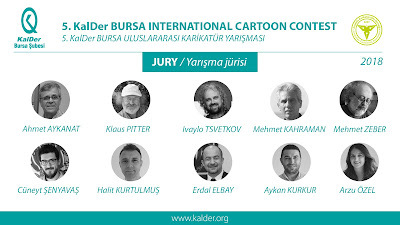 Application: Limited with three (3) caricatures, may be e-mailed to bursa@kalder.org in 300 dpi jpg format. 5. The caricatures can be published, yet should not be awarded in another competition. 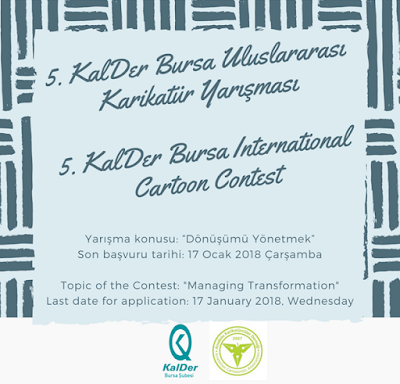 The caricatures will be published at www.facebook.com/kalder.bursa social media account between 22.01.2018 - 31.01.2018 for detection of plagiarism and resemblance. Objections will not be considered after these dates. 6. Competing caricatures may be printed and used in KalDer organisations (posters, books, albums, postcards, brochures, invitations, exhibitions, etc.) 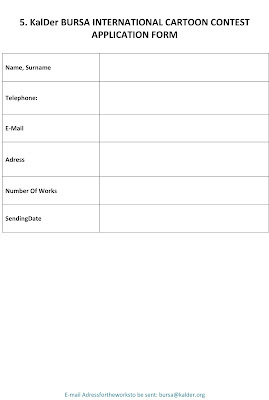 and published in internet environment. 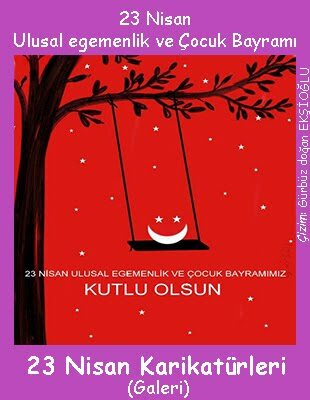 One of the artworks may be used as the main visual of the 16th Quality and Success Symposium which will be held in Bursa between 13th to 14th of April 2018. All remaining publication rights belongs to the author. Competitors are considered to have an agreement in these conditions. 8. 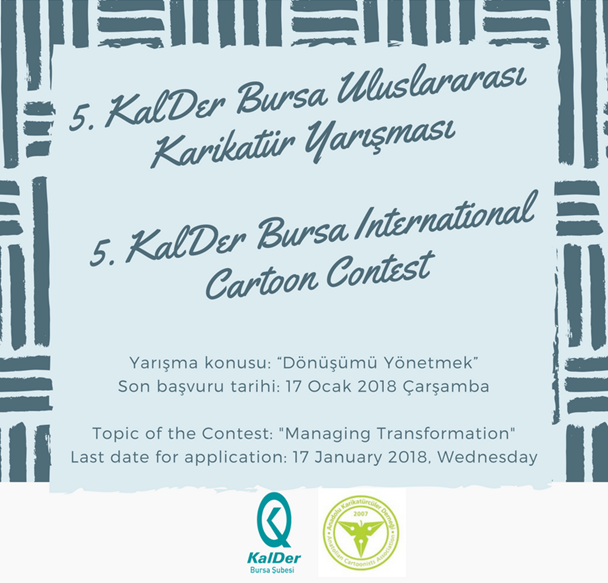 Results will be announced at www.facebook.com/kalder.bursa social media account on 10 February 2018, Saturday.